Oh boy! 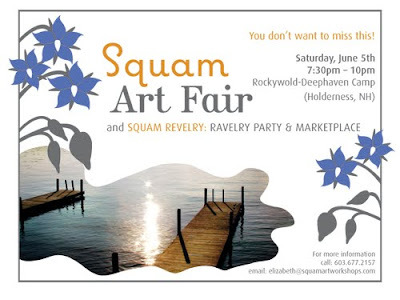 I feel like the luckiest person this evening as I prepare to attend the Squam Workshops with my dear mom. Thank you, Mama! We are all set for printing and painting and knitting and camp firing. I even get to take a class taught by this lovely crafter! Hoorah! And, we are so excited to be accepted as vendors at the art fair on Saturday night. If anyone happens to be close to Holderness, NH, stop by and chat! My favorite knitter and knitting designer, Ms. Kelly Bridges, will be hanging at the booth with us. Double hoorah! This past month has been wonderful and challenging and super busy and, at many times, quiet. Quiet like tonight when Chick and I read a library book about how bees make honey . Holy moly! The honeybee is the most unbelievable creature ever. We were in awe together, quietly chatting about the drones, the proboscis exchange of nectar, and all the rest. I urge everyone to learn a little bit more about our bee friends. Even Chick, who is quite frightened of the sting, seemed to fall in love with the furry, clever, little honeybee. And, noisy when Mouse decided to dress like a fairy and parade around the house singing and stomping. And, everything, really, but blogging and crafting. *sigh* June will be a horse of a different color since I am already scheming up a few new craft projects to share in this nifty little spot. Off to bed. Much too late.